Our September Job of the Month was close to home - literally! 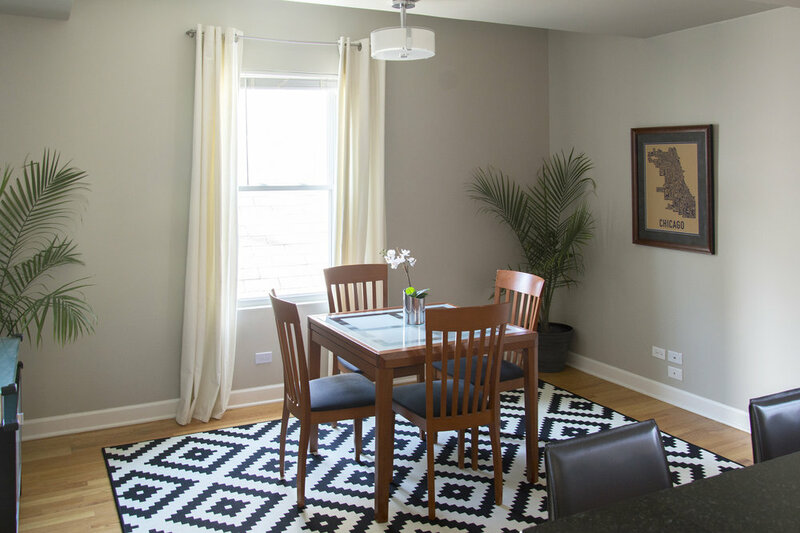 This gorgeous apartment was sold by members of the Blue Door Painting team, but not before a modern interior refresh. The Avondale apartment already had a lot going for it - a great location, tons of space and natural light, as well as owners who had cared for it - but the key to fetching a good price from a buyer was presenting all the positives of the space itself. Aside from choosing clean and attractive colors like Grey Cloud and Revere Pewter by Benjamin Moore to update the rooms, the Blue Door Painting team was careful to stage the home to highlight all the wonderful attributes that a new buyer might enjoy. 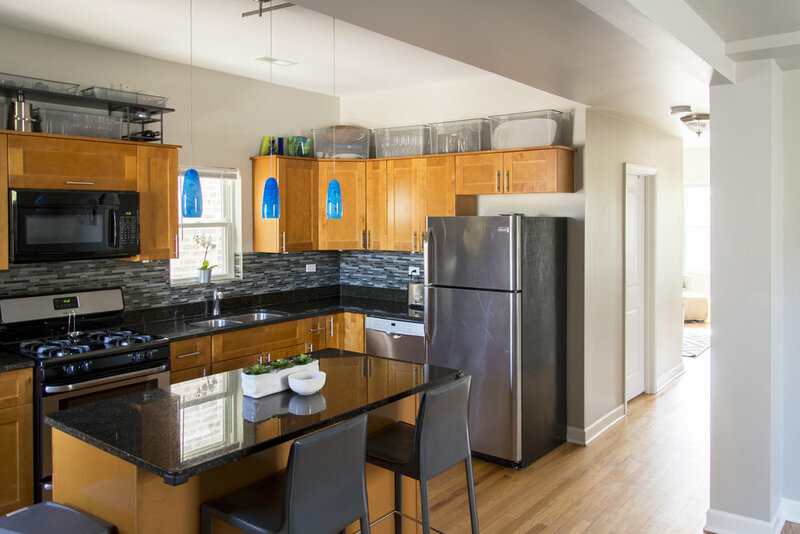 Especially for those transitioning from renter to owner, the pride of ownership extends far beyond being able to choose paint colors, so it’s important to showcase all the elements that make your house a home. When staging a home or apartment, don’t forget the basics - make sure the space is clean, organized and inviting before hosting an open house. Our interior design contacts would be the first to tell you to keep the details in mind; pillows, plants, curtains, even candles or fragrance can create a cozy, attractive atmosphere for potential buyers. Sticking with bright neutrals wasn’t just about staying on trend - this also allows for buyers to better visualize their own tastes when viewing the rooms. Overwhelming reds or dark blues or any color that’s striking and bold might work for you, but your buyer might be turned off by the daring choice. The formal dining room started off as a playroom, but you would never know! It was reverted back to its original purpose after clearing away clutter and setting up a more natural flow of traffic through the home. Buyers are looking for a great bedroom, so it’s savvy to focus a lot of energy on staging an impressive master suite. In this space, the bedrooms were tricky because of the attic ceilings, but the team was still able to set up a demonstrative room with appealing aesthetics. Don’t be surprised if you have to spend a little money on staging - pictures, posters, rugs and other decorative pieces might cost a few bucks, but they will add measurable value to your home. Because this space was attractive and move-in ready, it took only one day in the property listings to pull in numerous offers. Better staging = more offers, more offers = more demand and value. 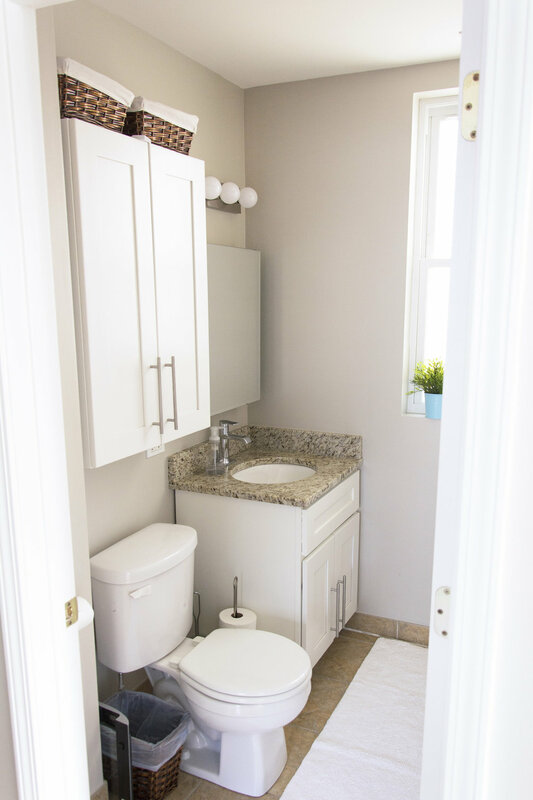 Aside from paint and decor updates, it can’t hurt to refinish floors, touch up trim and update kitchen cabinets and other hardware like bathroom faucets. Lighting fixtures need a facelift? Invest in some updated options that cast the room in the best light. Keep in mind the kitchens and bathrooms can make or break a sale. Swap that old bathroom vanity for a modern sink and add a beautiful backsplash to your kitchen for an instant revitalization. All set on the interior? Don’t forget curb appeal. Freshly painted front doors and finished decks can present a tidy image of a home that will look great for years to come. Selling soon? Contact us today for a FREE estimate so we can help you present the best version of your home to potential buyers. Follow us on Instagram for daily inspirations and read our 5 STAR reviews on Yelp, Angie’s List or Houzz.